Look at all the amplified telephone technology you can buy online! What, exactly, is an amplified telephone? It’s a telephone that does more than you are used to. It’s like a “super phone” that does new things. Do you need more volume? An amplified telephone can give you greater volume. How about the Equalizer Phone from Krown manufacturing? It means what it says and gives you louder, clear contact. The Ameriphone Clarity P-300 Photo Phone provides quick, clear photographs over your telephone simply by your own programming. Telemergency Ltd. Telephone Wireless Pendant Emergency Help System is the latest life saving device that amplified telephones can offer. If you are sick, or injured, or if you are the victim (or witness) of a crime, this innovative creation can be the link between you and the help you need. Imagine being in an accident and just pressing a button for help. Imagine if someone was trying to break into your car or home and you required immediate assistance. This little innovation could mean the difference between safety and danger for you. Both young and old can benefit from the Pendant Emergency Help System because it’s right at hand and available when needed. The Walker Clarity High Frequency Enhancing Phone will make voices clearer, not merely louder and can help anyone with hearing loss, whether serious or minor. It’s hard to understand words over the telephone with a hearing impairment and this little high-tech goody helps to solve the problem. Ameriphone Clarity Dialogue JV 35 Braille Phone is a wonderful new innovation for those who suffer both sight and hearing loss. Imagine being able to use a telephone for the first time in your life and communicate with other! It’s a breakthrough in technology that will be a great benefit to so many disabled people! There are several kinds of amplified telephones to solve many telephoning difficulties. No matter what the problem is, there is a way to use an amplified telephone that’s designed just for that purpose. Technology is advancing so quickly, it’s hard to keep up! 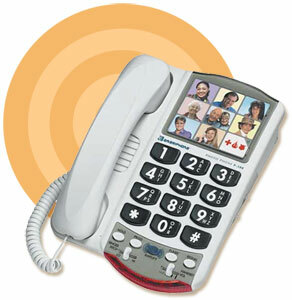 But you can count on www.TWAcomm.com to have the latest solutions to all of your telephony problems. Amplified telephones can work wonders in both private life and business. New amplified telephone technology enables the hearing and vision impaired to enjoy conversing and communicating as well as conducting business. This is the information age, the computer age, where everyone who has something to say is now able to say it. People who want to run businesses or keep in touch with distant relatives and friends can now do so, with the help of amplified telephones. With a quick visit to www.TWAcomm.com you can see all the amazing new innovative products that will help you to keep in touch with friends and conduct your business with no fear of communication gaps or misunderstandings. Check it out today and discover the whole new world that amplified telephone technology has opened up for you. Look at all the amplified telephone technology you can buy online! Try it out today!